Let’s face it, mornings are busy. Especially if your like me and sleep until the last-minute possible. To keep things running smoothly I try to keep these make ahead breakfasts on hand. They’re delicious, portable and perfect for the busiest of mornings. 1. Easy Egg Muffins – These muffins are healthy and toddler approved. Plus, they’re a great way to get extra veggies into your kids diet without them even knowing! 2. Homemade Buttermilk Biscuits – These biscuits are so much better than store-bought and taste great topped with apple butter, ham & cheese, sausage, egg, jam or anything else that you have on hand. 3. Homemade Banana Bread – My husband says that this recipe is the reason he married me so it must be good. 4. No Bake Energy Bites – The only thing wrong with these energy bites is that they’re so addicting! Your kids are sure to love them. 5. Pumpkin Chocolate Chip Muffins – I love these muffins because they’re always moist and freeze well. 6. 3-Ingredient No Bake Peanut Butter Bars – These Peanut Butter Bars are really good and way better than store-bought granola bars. You can store them in the refrigerator and grab them on the way out the door! 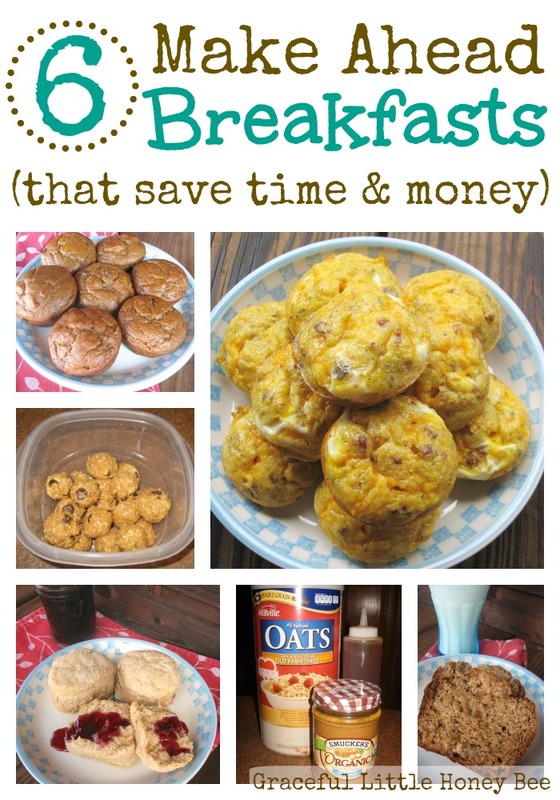 Hopefully you will try these make ahead breakfast recipes. My family loves them and I’m sure yours will too! Thanks for pinning! Have a great day! This is a whole lot of goodness all in one place! I have got to make the egg muffins! Pinning it.